This is my first book by this author and I enjoyed it one I was able to get into it. The blurb sounded interesting and as I began to read I began to think maybe I made a mistake and this might be a DNF for me. It didn’t take me long as long as I thought and I really began to enjoy this book. The authors writing style made it an easy read but what I enjoyed the most was the batter between Mike and Riley. It really was really amusing and I loved how the author was able to really bring out Mike and Riley’s flirtatious side. The secondary characters, especially Charlie, Mike’s nephew were also great. I would definitely read another book by this author. This book was a good quick read with lots of humor, cats, and of course love. As far as the characters go I really like Mike and Riley. From the moment they met they just seemed to click, well with the exception of the cats which Mike did not really care for. But like with any relationship Mike was willing to compromise and learn to like them because he was not willing to give up Riley. Riley was skeptical to believe that Mike would stick around for long and when the three little words came into play, Riley was even more skeptical but was willing to give things a try between them. I think that KM Magoney has a good short story here that is full of humor and was definitely a light hearted read. 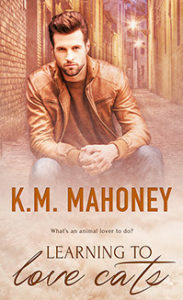 I really enjoyed it and look forward to future books by KM Mahoney. Born and raised in the middle of the Midwest, I have always been a dreamer. More often than not I could be found with my nose buried in a book (many of which I had to sneak past my parents). It wasn’t long before I started trying my hand at writing more of the stories I loved. After years of penning tales that rarely left the hard drive of my computer, I discovered M/M romance. As with all genres, it wasn’t long before my own characters started to take shape. There is little I love more than wandering new places and, on occasion, entirely new worlds with my characters. They can range from cowboys to Victorian noblemen, accountants to shapeshifters, and everything in between. I write mainly m/m romance, usually with paranormal or fantasy elements. I willingly follow my characters wherever they decide to go, sometimes with unusual results. I have little control over their actions ? any naughty behaviour is all their doing!